Photo Studio Pro for Android is an awesome photo editing app that is both powerful and multifunctional. It has a vast collection of editing tools that serves the purpose of basic and advanced editing. Each shot can be made to look like an art work. The wide range of effects can be easily added with a few taps. This includes filters, color enhancement tools and text editing. All these and more ready to use features are available that help you better edit photographs. Photo Studio Pro for Android has an amazingly beautiful interface which is both easy to use and intuitive. There are more than 200 unique filters which are all ready to use and can be applied on to any image with a few taps. The filters include amazing special effects, rich frames that suit various events, stickers, textures, shapes and correction tools. You can correct lighting, color, tilt, blur, sharpen and also boost lens. Apart from automatic tools, you also have manual correction tools to highlight, fix or improve a part of an image. Mask correction tool helps you apply filters and tune your photo effectively. Photo Studio Pro for Android has a collage editor which combines several photos into one amazing photo collage. You can apply a wide variety of frames, shapes and backgrounds. Apply templates and stickers to make it look unique. There are magic tools that let you blend features to apply on two or more images using different blend modes, masks and background. Color splash highlights objects on photos and clone stamp copies objects. Create impressive text messages using text editing tools. Photo Studio Pro for Android is the number one all in one photo editing application for photographers of any age and proficiency. You can be a novice or a professional, the app allows you to handle it with ease. Artworks is what you get as an end result which you will be proud to share it with your family and friends. 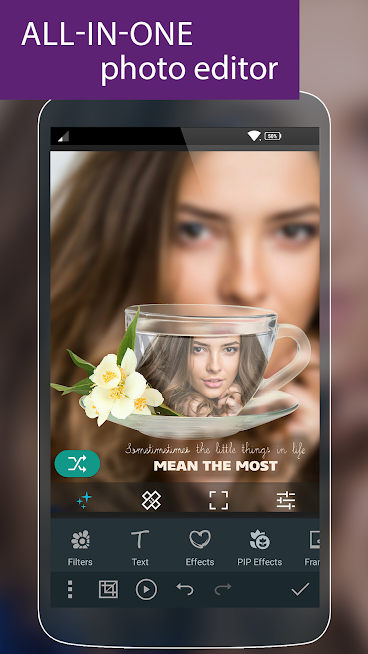 The app is one stop solution for all thing related with editing photographs. The app costs $9.99 to download from Play Store.